Yes, I’m digressing again on craft subjects. Hope you don’t mind. My first love being sewing, I just can’t stay away from it. On my last post I neglected to mention why I seriously can’t live without Birch Street’s Swedish Tracing Paper. It came in handy this week when a friend asked for a heavy cotton slip in black fabric for winter wear. I used a new cotton slip that she just bought as a basis for my pattern. 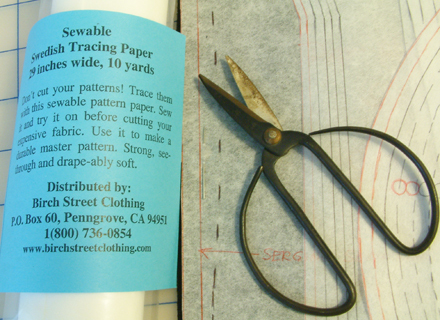 By pinning this very pliable tracing paper to the slip I was able to trace out the seamlines. After unpinning, I took a few minutes to true up the tracing lines and now I have my own pattern to work with. It also came in handy recently when I procrastinated on JoAnn Fabrics Butterick sale. The pattern pieces to the right became my solution to enlarge (by two sizes) a 99 cent sale pattern that was no longer in stock in my size. Silly personal issues include being short, disproportionate, and one of those woman who have been gaining and losing the same 5 lbs. over and over again for years. So, when it comes to those expensive patterns like Folkwear , I don’t cut them out, but rather trace, alter, then cut out pattern on tracing paper. As you can guess, all of this hardly ever makes for “sew a dress in an afternoon”.